You probably learned as a child that different types of laundry need to be washed at different temperatures. 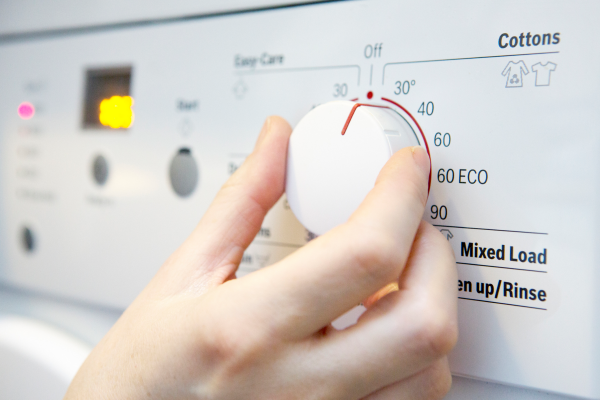 When faced with a washing machine, though, with an endless selection of dials and buttons, it can be tough to decide exactly which parts of your laundry need which temperature. Understanding what happens at each temperature can help you decide on the fly, without having to memorize a list. Here’s what you should know. Water temperature plays a key role in the complex process that takes your laundry from dirty to clean. In theory, the hotter the water, the cleaner the laundry. In reality, though, choosing the wrong setting can actually destroy your clothes. Hot water, defined as 130 F or above, is best for very heavily soiled laundry, and to remove germs. Use it for cloth diapers, ground-in dirt, and an occasional disinfecting cycle for sheets and towels. Never mix lights and darks when washing in hot water, as colors can fade. Also be aware that brightly colored fabrics may look uneven after a hot water wash. In addition, hot water can shrink many different types of clothing. Warm water, defined as approximately 90 F, is the best general-purpose laundry temperature. It provides powerful cleaning action without much risk for shrinking or fading. Jeans and most daily-wear clothing do well in warm water. When in doubt, warm water is generally a good choice. Delicate fabrics and very dark or bright colors should be washed in cold water, defined as approximately 80 F. In addition, laundry that is stained with blood, coffee, or red wine should always be washed in cold water to avoid setting the stain. Cold water washing is sometimes recommended for all laundry as an energy-saving measure, but this can be false economy. Cold water is not as good at cleaning laundry as warm water. You may need to pre-treat clothing before washing it in cold water, or even wash it twice to get it completely clean. Regardless, you will need to use more detergent for cold water washing. If your washer provides the option, always choose a cold water rinse, regardless of the wash temperature. A cold rinse has no negative effects on laundry, but provides the benefits of saving energy and reducing wrinkling. If you are unsure what wash temperature to use, check the tag on the item. Most clothing and linens have care tags with recommended washing and drying instructions. If your item is missing its tag, consider the color and material. Lightweight delicate fabrics of any color do best in cold water, as do bright or very dark colors. Everyday wear is generally best washed in warm water, while hot water is ideal for very soiled items. Sometimes the temperature of the washing machine water is not what you would expect. Use a candy thermometer to ensure that the hot water setting delivers water of 130 F or above, the warm water setting delivers water of between 90 and 110 F, and the cold water setting delivers water of 60 to 80 F. Wash water below 60 F will not clean clothes very well at all, while water that is far above 130 F can damage fabrics. Stains can be tough to remove. For best results, pre-treat them with a bit of detergent or a special pre-treating product before washing. Even at temperatures of 60 to 80 F, cold water washing does not provide as much cleaning action as warmer water washing, but it is essential for some items. If you plan to wash items that are more than lightly soiled in cold water, pre-soak them for at least a few minutes. If you need to cold wash something that is stained or heavily soiled, pre-soak it overnight.